Yesterday, and again today, I spent a nice couple of hours reacquainting myself with this performance which I had not seen perhaps since its release over a decade ago. I remember being very moved by it then, and fail to understand as to why I waited so long to experience it again. What a stunning, theatrically compelling and insightful production Marthe Keller put upon the Strousburg stage. Many would complain about the starkness of the set which is, more frequently than not, bare. Poulenc's opera (as John Dexter's similarly spartan stage proved decades before) holds up well in such a "setting" allowing not only more detailed portrayals of its finely nuanced characters, but for the viewer/listener to focus on those portrayals. The reward is a rich one in such a case as this. Anne Sophie Schmidt gives us a deeply touching portrayal of Blanche, her face - particularly when framed by her wimple - registering every one of the frightened by the world, heroine's emotions. Those nuances come through, too, in her handling of the music, though (as is the case with several other cast members) high notes can feel a bit screeched out (of course, Poulenc is not easy on his singers, requiring some specatcular "leaping" effects at the ends of phrases). The always wonderful Patricia Petibon gives a performance of Constance that elevates the chirpy young nun to a place of genuine dramatic prominence. The scenes between Blanche and Constance are powerful, a real connection is made between these two young novices which makes the final moment of an already overwhelmingly emotional scene, almost unbearable in its poignancy and strength. Hedwig Fassbender is a strong presence, and captures brilliantly the almost over zealousness with which she wants the order to pursue martyrdom - it's almost an obsession. Her street scene with the Priest when she realizes she is not to be martyred presents a powerfully conflicted and wilfull woman denied the one thing she most desired. Even if it took a few minutes for me to warm up to the voice of Valérie Millot, she made a fine and touching Mme. Lidoine - entirely believeable in her modesty. I have always been something of a fan of Nadine Denize and she captures, quite perfectly, the severity, hope and charm of Madame de Croissy. Her death scene is (as it built into the role itself) one of the most chilling, terrifying moments one can experience on stage. I loved the connection here between de Croissy and Blanche, the young nun cradling the dying woman - a symbol of authority and order she so much needs in her life. I dare anyone to keep a dry eye here! As a director, Keller provides some amazing effects in her production, an almost air-raid style roar near the end, the filmed sequences in black and white which are captured beautifully on DVD (and which only during the curtain calls does one notice the movie screen at the rear, meaning the in- house audience got the same effect). Particularly, the violent ripping off of the sisters' facial veils by the Revolution Council officers, and the March to the Scaffold. The final scene is simply staged, the nuns - all now in tattered white with self-decorated black grease chalked crosses each marked herself with as they were condemned to death, holding each other together in a huddle, hands and arms draping themselves almost as a single organism before simply lining up for the guillotine, each collapsing at her moment of death until Blanche's turn, whereupon she walks amongst the corpses of her fallen sisters, fearless and serene. Film director, Don Kent, in (apparently) his first televised opera production does not have a single faux pas - capturing every moment for maximum impact. His ability to captures the myriad - almost never ending - dance of shadows and light, minimizing the use of the facial close-up too prevalent in opera videocasts these days, all revealing someone with a genuine gift. (Kent has since gone to be video director for some truly wonderful operatic DVD experiences: Platee, Lucia, Onegin, Traviata, Ariadne, and more). 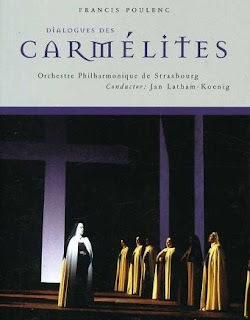 Conductor, Jan Latham-Koenig "feels" this score to his bones and the results show in his work with the chorus and orchestra of the Opera National du Rhin forces.